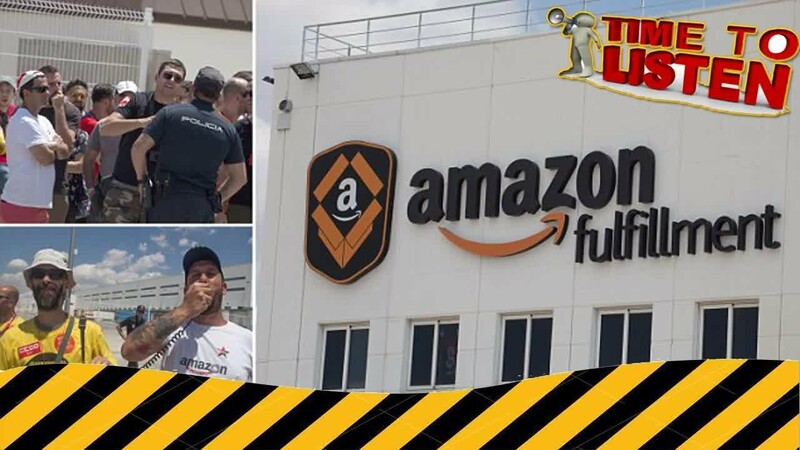 Despite Amazon’s history of union-busting activities and employee mistreatment in the United States, the company has struggled to cope with the activities of Europe’s organized workers’ movements. Amazon’s flagship annual sales event, Prime Day, encountered a tangle of difficulties starting Monday as aggrieved workers, boycotts, and a range of technical glitches brought new attention to the online retailer’s troubled internal regime. For four years now, Prime Day has grown as the company’s top promotional event, bringing billions in revenue on a level comparable only to the holiday season’s Black Friday. For the past several weeks, the company has promoted the event widely across its site and various online media. The promotion is a 36-hour event. Yet sales expectations are being tempered this year by the fact that mere minutes after Monday’s sale began, the site and its mobile app suffered a 45-minute outage – one of the company’s worst to date – with the app simply reading “UH-OH, something went wrong on our end,” discouraging shoppers who were chomping at the bit over the limited-time sales. The company’s Prime Day troubles were also compounded by widespread labor unrest in Europe, where Amazon employees used the event to hold work stoppages and strikes in a bid to amplify their demands that the company cease enforcing its tough working conditions while slashing health benefits and wages. The strike call quickly resonated, as workers in England, France, Germany, Italy and Poland united around the call to hold a transnational strike. Workers in Europe have complained of a physically strenuous pace of work, as well as poorly heated and ventilated warehouses that are strictly regimented by third-party security firms contracted by Amazon. The holiday season has typically seen upswings in militant actions by workers. On Tuesday, German union Verdi joined the strike, announcing that on a day when prices are slashed by millions while “the profits are bubbling,” the workers would hold a work stoppage and demand a collective health-care agreement in light of the “severe physical and mental stress” caused by work conditions. The company is also facing boycott calls in the United States, where racial justice and anti-white-supremacy groups plan to hold rallies through Tuesday in protest of the sale of Nazi German, Confederate, and white-nationalist books, music, paraphernalia and clothing through Amazon’s network of around two million independent vendors. Last week, a report by The Partnership for Working Families and Action Center on Race & the Economy noted that Amazon sells a plethora of pro-fascist, white-supremacist and anti-Black, anti-Jewish, Islamophobic and anti-gay merchandise despite its policy to ban content that promotes or glorifies “hatred, violence, racial, sexual or religious intolerance” or organizations with such views. A close examination of Amazon’s various platforms and services reveals that for growing racist, Islamophobic, and anti-Semitic movements, the breadth of Amazon’s business combined with its weak and inadequately enforced policies provides a number of channels through which hate groups can generate revenue, propagate their ideas, and grow their movements. Despite stumbling out the Prime Day gate, the company remains the default “everything store” for most U.S. online shoppers – a fact that is unlikely to change anytime soon. With 44 cents of every e-commerce dollar being spent on Amazon.com, an 83 percent commanding share of the e-book business, and a majority of the cloud-computing industry nestled in its Amazon Web Services, the company is sure to continue raking in record profits like the $1.9 billion made in the last three quarters of 2017. On Monday, Amazon CEO Jeff Bezos’ net worth exceeded $150 billion, making him the richest man in modern world history. This is due, in no small part, to the hideous conditions Amazon’s global workforce suffers. In the meantime, suppliers are also being asked to shoulder the transportation costs that the retailer had previously paid in its drive to shoulder out Walmart and other retailers as a daily provider of household goods. Amazon is doing all that it can to boost its profit margins across the board, and keep its stock soaring. But as Prime Day 2018 clearly showed, Amazon is hardly immune to the side-effects of its Godzilla-like growth into the form of a monopoly-sized entity. This article is licensed under a Creative Commons Attribution-NonCommercial-ShareAlike 3.0 International License. This entry was posted in Civil Rights, Demonstrations & Protests, Economics, Income Inequality, Peaceful resistance, Social Justice, Solidarity, Unions and Organized Labor, Women's Issues, Workers' Issues and tagged Amazon, automation, boycott, Capitalism, Civil Rights, Economics, Equality, Europe, Income Inequality, Jeff Bezos, Keith Ellison, Prime Day, Protests, social justice, Solidarity, Spain, The Partnership for Working Families and Action Center on Race & the Economy, Unions, Women's Issues, Worker's Rights, workers' issues on July 19, 2018 by MNgranny.